This is a project which I started during a cooking world tour. Our first two destinations were Malta and Hawaii, and since my prefered flavours are Mediterranean and Middle Eastern, Malta is my favourite of the two. It is influenced by the whole Mediterranean and Levante region and blends together the best elements from all those countries. There is just one concern for those of us who are gluten free: The pizza issue which occurs in every one of those regions. Call it pizza, pita or whatever you like, those flat breads or pockets with filling are not accessible unless we make our own. 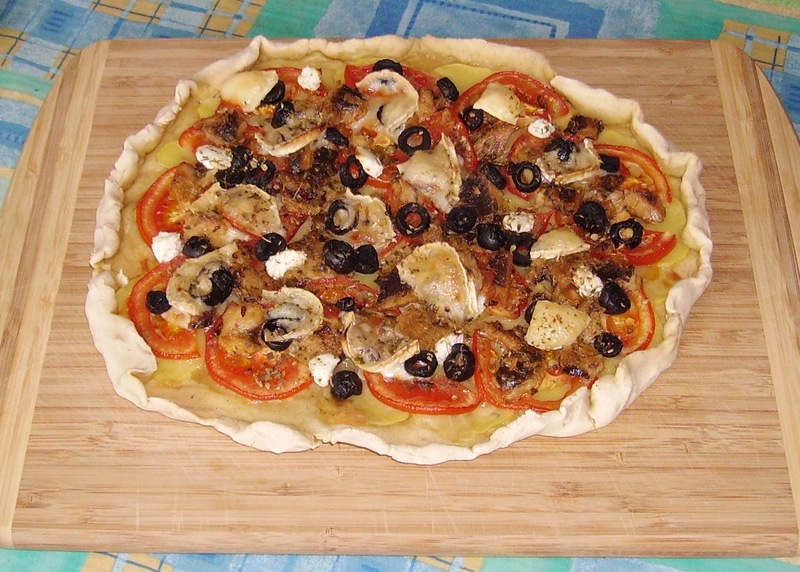 So I took the Challenge to make ftira, the Maltese version of pizza, my own gluten free way. I call it a project because my first attempt at it was delicious, but the dough was not perfect. For a start, I followed the instructions of traditional ftira dough, to see what happens when made gluten free and to learn what should be made differently to get the desired result. That's what I post now - I'll update when I've tried another method. Traditionally, the dough rests in a warm spot for about three hours, then rests in the fridge overnight. I made it the other way round: First rest in the fridge overnight, then four hours in the warm kitchen. After rolling and filling it, it did not rise anymore or bake up in the oven - I already expected that but wanted to try. So I ended up with a thin and very crisp crust which I loved because I love pizza with thin crisp crusts. Usually the best thing to do with gluten free yeast dough is to knead it and then let it rise in the final shape. Which means, knead it and then form the loaf or crust or whatever you want to get at the end, and then let it rise. So, when I make this again, I won't let it rest overnight but will make it an hour before it goes into the oven, make the crust and let it rise in a warm place. Still, even though it didn't puff up in the oven, it really was very yummy! Also I have to experiment a bit with baking time and temperature. The recipe said 20-30 minutes at 200°C. I think 220° will do better, so that's what I'll do next time, too. For the dough I used the flour blend which I usually use for pizza. This recipe makes two of the ftira which you can see on the photos. I only made one and froze the second portion of the dough for later use. This was the perfect amount for DH and me for lunch / dinner. Blend together the flours and xanthan gum. Of this blend take 2 cups and place in a bowl, you will have 1/4 cup left which you can use for dusting the work surface. To the two cups, add salt, yeast and sugar. Add oil and water, 3/4 cup first, then as much more as is needed to get a soft but still kneadable dough. This is best kneaded by hand to get a feeling of the consistency. Sprinkle your working space with some of the remaining flour mix, the knead the dough for some minutes. Form a round loaf, lightly oil a bowl, place the dough in the bowl, cover with cling film and let sit in the fridge overnight. The next morning, get the dough out of the fridge and let it sit in a warm place for at least three hours, four are better. When ready to bake, preheat oven to 200°C. 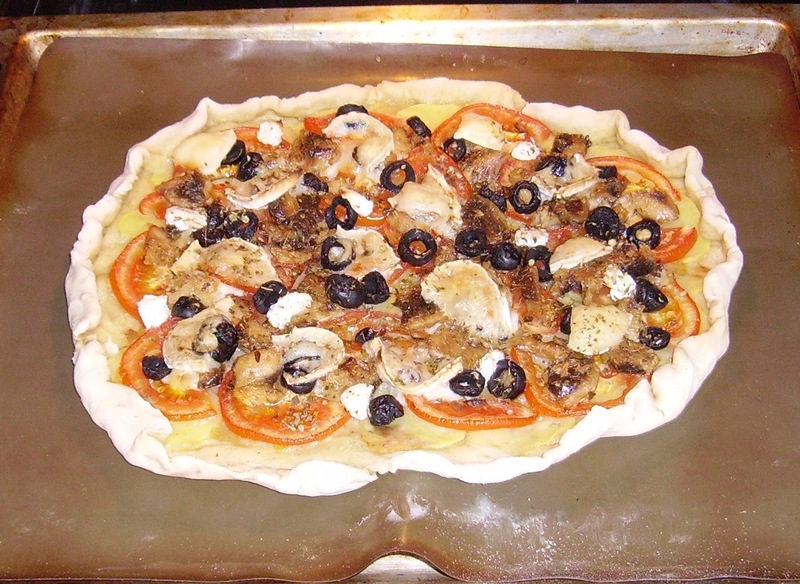 Place one portion on a baking tray layered with baking paper or a silicon mat like the one you see on my photo. Roll it out (best between two sheets of baking paper) or just flatten and pull it with your hands as I did, until you have an oval or rectangle which is about 30x25 cm wide and about 1/2 to 3/4 cm thick. Thinly slice the potato and layer it on the dough, leaving a spare rim of about 3-4 cm. Lightly sprinkle the potato slices with salt and pepper. Thinly slice the tomato, cut the slices in half and layer over the potato slices. Mince the garlic and scatter over the tomatoe slices. 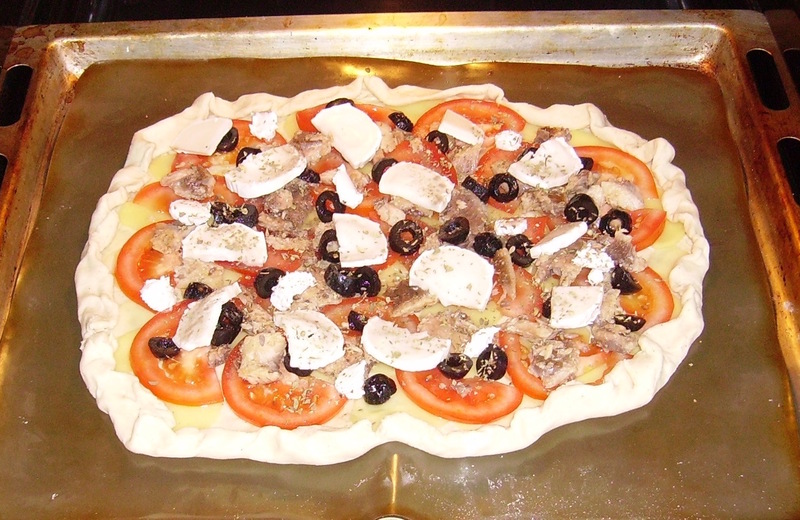 Scatter the sardine pieces over the tomatoes, then the sliced olives. Lastly add the cheese and sprinkle with dried oregano. Bake at 200°C for about 10 minutes, then rise the temperature to 220°C and bake for another 10-15 or so minutes. Pull out of the oven and let cool a bit or serve immediately.